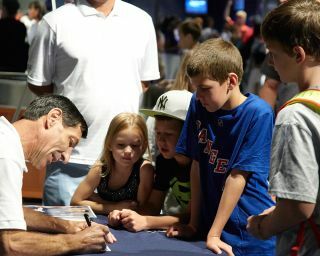 NEW YORK — The Intrepid Sea, Air and Space Museum was bustling early Friday (July 26), as hundreds of visitors waited patiently to take part in the second-annual SpaceFest celebration aboard the converted aircraft carrier on the western edge of Manhattan. The Intrepid is hosting the four-day space-themed event to promote science and exploration, and to showcase the museum's most famous artifact: the space shuttle Enterprise, NASA's prototype orbiter that was used in the late 1970s for approach and landing tests in the early days of the space shuttle program. "I've seen the shuttle before, but I'm hoping to see it again today," said Joseph Negron, age 10. "It's totally awesome and ginormous. So huge." The Intrepid's Space Shuttle Pavilion reopened to the public on July 10, after months of reconstruction to repair damage caused by Hurricane Sandy last October. The hurricane destroyed the temporary structure that had been built to house the shuttle prototype on the deck of the World War II-era aircraft carrier. In addition to touring the new Space Shuttle Pavilion, SpaceFest attendees were also on hand for Friday's unveiling of a 3.5-foot long (1.2 meters) LEGO replica of the shuttle Enterprise. The model, which was crafted using about 15,000 pieces, features payload bay doors that can open and shut, and fully retractable landing gear. Ed Diment, the LEGO "Master Builder" who created the toy model, spent two months building a 1/40th scale prototype of Enterprise. After that, it took about two weeks to assemble the replica and add the finishing touches, he said. "I want people to see the kinds of things you can achieve with engineering, and hopefully it will inspire them to come up with the next generation of things that will come after, now that the space shuttle has been retired," Diment told SPACE.com. The model weighs about 20 pounds, and will go on display in the Intrepid museum after the SpaceFest celebration wraps up. Diment previously built a LEGO replica of the U.S.S. Intrepid, which is also displayed in the museum. "I don't know where it's going to be, but maybe they'll put it on the back of the Intrepid model, so it'll be just like the real thing, with the space shuttle on the deck of the aircraft carrier," Diment said. Michael Kalenty, a 15-year-old from Hillsborough, N.J., is one of the SpaceFest exhibitors representing FIRST Robotics, a high school robotics organization that aims to promote the study of science and engineering. Kalenty and his teammates will be demonstrating their robotic creations throughout the course of the SpaceFest events, and he said he hopes other kids will be inspired to join programs. Before the crowds started rushing in, however, Kalenty took a moment to admire the LEGO Enterprise model, which was on display under a neighboring tent. "I read that the model was going to be unveiled here on the pier, so I was excited that I would actually have time to go see it," Kalenty said. Others were interested in the hands-on science experiments and interactive displays that were set up along the pier and inside the Intrepid's hangars. "I came here last year, and I thought they had a lot of great things to offer, so we wanted to come and learn about what's new," said Kerry Brennan, a teacher from Boonton, N.J., who brought along her 10-year-old son Turner. "I'm excited to learn about all the things about Mars and the Curiosity rover," Turner said. Samuel Gensen, an 11-year-old from Belgium, is visiting New York City with his family. As he walked around the converted aircraft carrier, he was particularly taken by the various space artifacts on display. "It's the first time we've seen spaceships, so we're kind of happy," Gensen said. Inside the Space Shuttle Pavilion, visitors gazed up at the shuttle Enterprise, which sits raised just 10 feet (3 meters) off the ground. "It's amazing seeing the size of it, and getting some appreciation for the shuttle itself," said Helena Pelletier, from Ontario, Canada. "One of our friends actually flew in the space shuttle — Chris Hadfield," she said, referring to the famed Canadian Space Agency astronaut who recently completed a six-month stay on the International Space Station. Amid the fun and games, Vic Smith hoped SpaceFest would help his children learn more about NASA's now-retired space shuttle program, and help nurture their interest in science and technology. "Our initial plan was to come and check out the unveiling of the LEGO model, and then see the space shuttle," Smith, who is visiting the museum from Minneapolis, Minn., with his sons Lendale, 13, and Francis, 9, told SPACE.com. "I want to get them inspired by all this space stuff."